An alternate title for this post could be “That one time I threw together a birthday party in 28 hours.” But that seems a bit wordy. The youngest’s birthday falls just a few short days after Christmas. We are usually visiting family out of state this time of year but this year we enjoyed Christmas morning in our new home. The boy desperately wanted to have his “friend” party ON his REAL birthday. So we did. After spending the weekend at the in-laws we returned to our messy, post-Christmas morning house with not a single themed napkin or matching goodie bag purchased. The only thing I’d done ahead of time was the invitation. I can do just about anything with a good printer, some cardstock, and a Google Images search. Here’s how the party planning all went down. 12:00 p.m. Sunday – Return home, unload, unpack. Start cleaning. 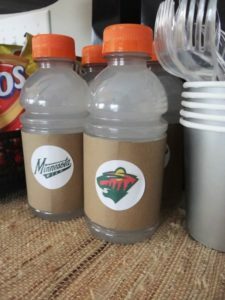 1:30 p.m. Leave for Party City and local sports store to attempt to find something with the required MN Wild Hockey theme. 2:00 p.m. Stop by Home Goods/Marshalls to shop for myself instead. 4:00 p.m. Return home, quick freshen up, and off again to see a hockey game with the fam. 9:00 p.m. Return home again. Put kids in bed. Go to Walmart for party food and more goodie bag stuffers. Yay for pre-made subs and fruit cups! 11:00 p.m. Bake a cake, print off hockey bingo cards and word searches found on Pinterest. Also make and print MN Wild stickers to stick on Gatorade bottles and goodie bags (eventually forgetting to stick them on the goodie bags). 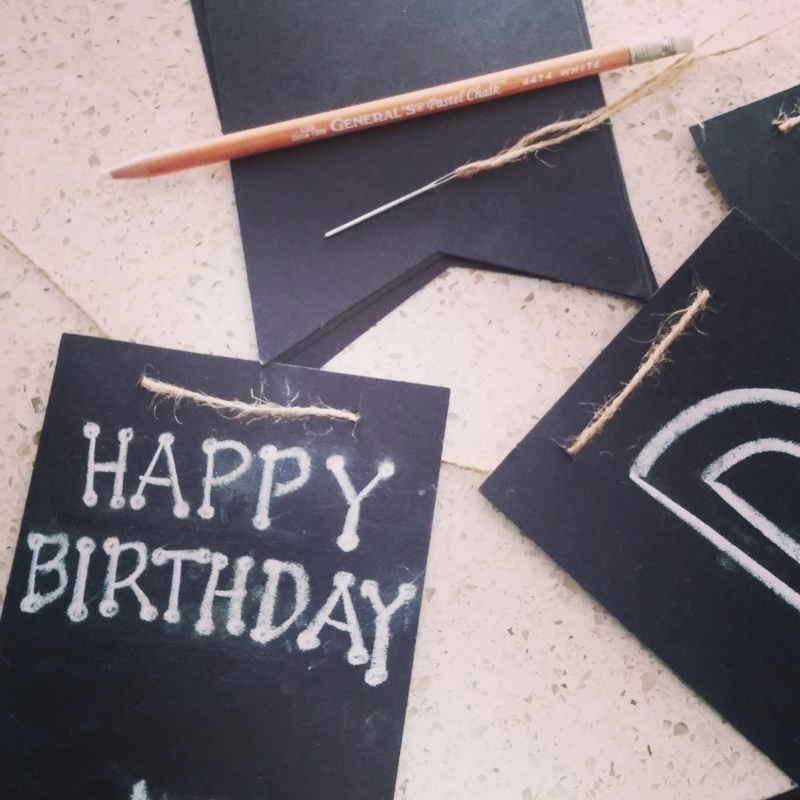 Make awesome chalkboard banners and do a little light cleaning and decorating. Tips for awesome banner: Chalk pencil for letter details and a needle to thread the jute through the tiny pre-cut slits. 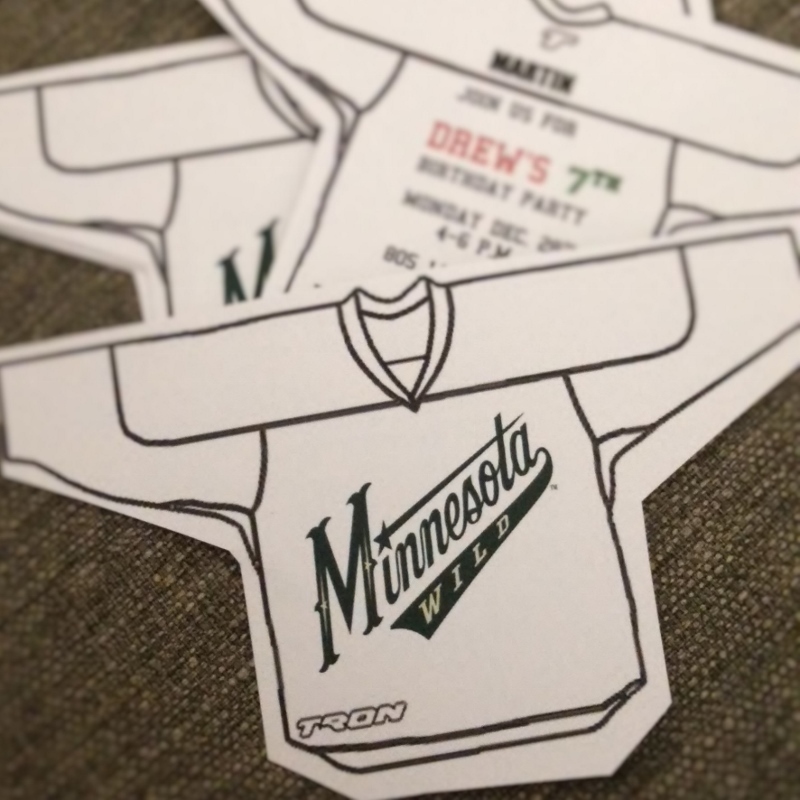 Overall though, the banner set was worth the extra from Party City. Good enough quality to be reusable. Okay…a good printer, cardstock, Google Images search, plain white printable sticker paper, and a 1.5″ hole punch. 1:38 a.m. Go to bed. 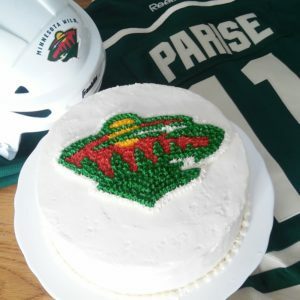 Vanilla cake with dyed green and red layers inside. 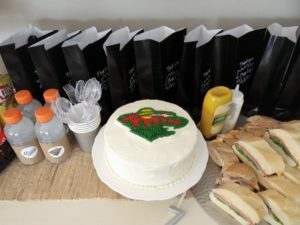 Printed the Wild logo onto paper, then piped over wax paper with the paper underneath, freeze, transfer to cake, and touch up. 2:45 p.m. 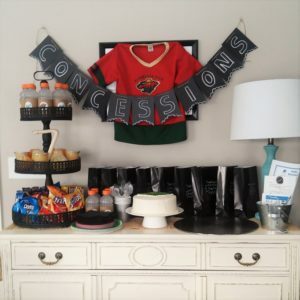 Snap pictures of party set up while avoiding touching anything with securely wrapped finger. Maybe too secure, why is my finger tingling?? 4:00 p.m. Guests arrive, party starts, everyone has an awesome time, and no one is injured. Again. 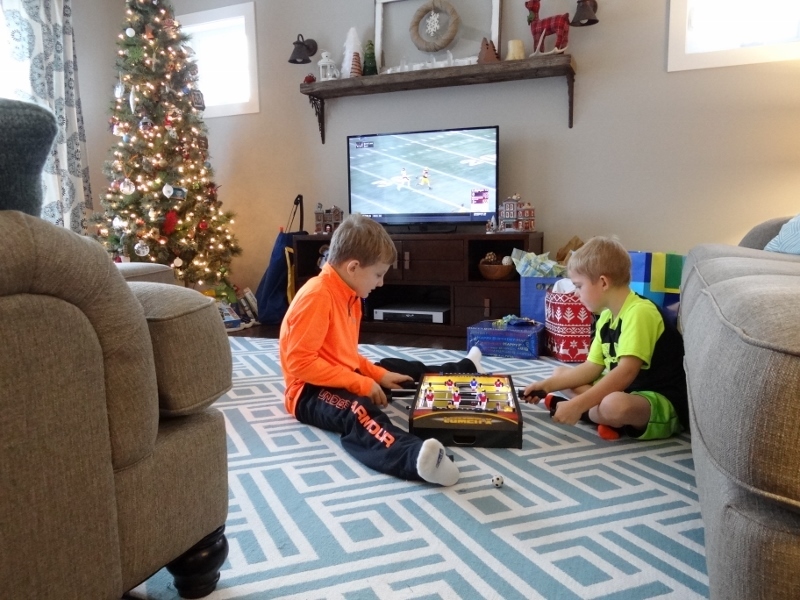 A rare quiet moment during the party.